Sole Fitness, is the company behind the best selling Sole E35 Elliptical, several other elliptical machines and many popular treadmill models. Not enough people pay attention to who may be manufacturing their fitness gear and equipment. It’s rather important to pay attention because it’s often the manufacturer who can tell you what you expect from any given fitness gear or piece of fitness equipment. In many cases, the manufacturer can often indicate the type of quality, make and/or type of fitness equipment you might end up buying. In 2016 Sole released a new and updated line of elliptical trainers (7 8 models) and treadmills (6 models). Their previous models dated back to 2013. That’s especially the case with fitness equipment from lesser known brands. Even if you buy fitness equipment from a well known brand, you’re more or less buying equipment that, well, everyone’s used at some point. With relatively obscure equipment, you don’t really have much to go off on, except just a few reviews and other consumer impressions that are pretty much valuable. While a lot of people are learning more about SOLE Fitness in name (and in the states), a lot of people don’t know that much about the brand yet. As a growing fitness brand, they’re actually considered one of the fastest growing fitness brands in the world. Sole Fitness – Fast Growing? Well, what makes SOLE Fitness one of ‘fastest growing fitness brands in the world?’ What’s really special about their fitness products? There’s one word that has more or less supported SOLE Fitness’ sudden rise in the fitness world: affordability. After all, you can’t buy fitness equipment that won’t last a long time – or even short amount of time – right? SOLE Fitness removes that particular worry from their own line of fitness equipment, promising rather well built and efficiently operating equipment at attractive prices. While they’re not the lowest prices on fitness equipment, they’re great prices for people who want to know if they’re getting quality equipment that will pay for itself—but, more on that later. That particular price point also has another reason for existing, too. SOLE Fitness originally didn’t make available their fitness equipment in, what you would say, traditional sales channels. 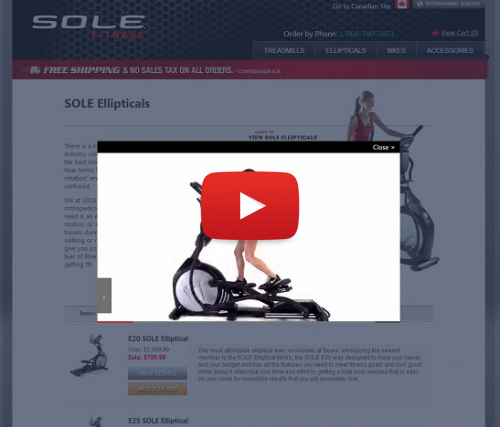 Where did SOLE Fitness originally make their fitness equipment available? And, what does SOLE Fitness do today to make their products available to everyone? Well, to start, SOLE Fitness originally used to only sell their products to hotel establishments, specifically hotel establishments that had a fitness center and/or gym on their premises. They regularly work (and still do work) with hotel groups like Hilton Hotels, Hotel Monaco and Omni Hotels. They usually manufactured their popular treadmills for these particular hotels, mainly for use in-room—usually, their hotel rooms. Though, as mentioned, many SOLE Fitness products are used in their on-premises fitness centers. Due to their innate popularity, SOLE Fitness eventually started manufacturing their products for direct sales to consumers like you. Some people even say that SOLE Fitness could easily double their current pricing, though they choose to keep it affordable for, well, everyone! That sounds great! Well, I’m interested. Where can I find SOLE Fitness products? And, do they happen to ship within the United States and/or Canada? You can find SOLE Fitness’ various products at their official website, solefitness.com. Of course, when you get there you’ll immediately see several listings of their available products. Most SOLE Fitness products have prices ranging from as low as $799 to premium prices at as much as $2,299. If you’re wondering about the prices, think about the cost to manufacture that type of fitness equipment for hotel establishments and even home users. You can’t create a great piece of fitness equipment without guaranteeing some kind of quality, you know? So, SOLE Fitness ensures that their equipment is manufactured to that standard while charging a fair price for the quality that they’re offering. And, that’s why you should expect that from SOLE Fitness and their products. Though, enough about prices—let’s review where you can probably find SOLE Fitness products. While they’re mainly available through their official website, some fitness equipment retailers may have SOLE Fitness products available for sale. Some might even have discounts on certain products, though you will have to keep an eye on them! If you’re wondering about if SOLE Fitness ships their products throughout the United States, they do, since they’re based within the United States. They also ship to Canada, so you don’t have to worry about going through a third party if you happen to live in Canada. And, if you don’t live in either country, many other companies do carry and distribute SOLE Fitness products around the rest of the world. So, can you tell me what SOLE Fitness might have available for sale, at this time? And, what can I expect out of SOLE Fitness’ products? That’s a good question! 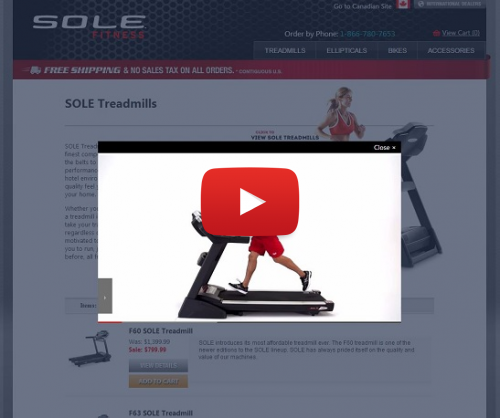 SOLE Fitness is best known for manufacturing treadmills for both hotel use and home use. Those treadmills of theirs first became popular after many people used them within hotels while traveling. Since they became that popular, SOLE Fitness began manufacturing and selling those same treadmills to consumers via their websites and other fitness retailers. SOLE Fitness is best known for having eight different treadmill models, in addition to five elliptical machines and an exercise bike. Of course, you can expect all of those machines to be made with the highest quality materials possible, since that’s what SOLE Fitness has promoted ever since they started manufacturing their hotel quality fitness equipment for the home. All of SOLE Fitness’ fitness equipment are backed by a robust fitness warranty, one that’s considered the best in the fitness industry, so if you experience any issues with any SOLE Fitness product, you can expect them to have you covered. They currently offer warranties spanning as low as 5 years to as much as 30 years, covering various internal and external components of their machines. So, basically, SOLE Fitness has you covered, if you ever have your fitness equipment fail in any way. That reliability also goes for their return policy, if you choose to order direct from them. So, if you wanted to return any of their products, they’ll eventually refund the entire purchase and cover shipping as long as you follow their return policy. The SOLE E35 Elliptical is their top selling elliptical machine. The SOLE F63 is their top selling treadmill. It’s also worth noticing that almost each year you can find some great SOLE Fitness Black Friday deals on their company website. You can get free shipping on SOLE Fitness treadmills here & you can get free shipping on SOLE Fitness elliptical machines here. Sole Fitness Black Friday & Cyber Monday Deals: 2018 Edition!